Which came first, the chicken, or the road it crossed? That's actually an easy question to answer. The chicken came before the road. Well, I mean, it depends on your definition of road. Is a road something built by man? Or could a road be a trail that has been used for hundreds of years? Herd animals who migrate tend to use the same paths every year for the migration. So, in a sense, their trails could be roads. And if that's the case, there have been roads for longer than chickens. But, if you are like me, a road is something that has to be built. A trail or path is just a cleared track to follow. A road consists of distinct layers of materials combined to form a permanent, hard packed pathway. So, if that's the case, then the chicken came first. That's because the first real roads were made by the Romans. Other civilizations have paved streets in their cities, but the Romans were the first to extend the paving out of the cities and into the country to connect cities. Roman engineers got so good at building roads that there are some still in use today. I don't men they are around and you can look at them, I mean, people are still using them. You hear that WiDOT? Romans built a road 2,000 years ago that's in better shape than the crap you make me drive on that you built last year! But this isn't a post about roads. It's a post about chickens. More specifically, it's a post about which came first, the chicken or the egg. But first, the answer to yesterdays Made Up Monday. It's true. But, before you get all grossed out, once the wasp dies, enzymes in the fig break the wasp down into proteins that get absorbed into the fig. So, the wasp actually becomes part of the fruit. And it's not like you aren't accustomed to eating bugs in your food. So, yes. Every time you eat a fig or anything with fig in it, you're also eating a wasp. Or part of a wasp. But fear not. Those little crunchy bits n the fig? Just seeds. But seriously folks, this is a question that most people think has no answer. They say it's a paradox. But in reality, it's not. It's not even a single dox. And I'm here to fill you in on the truth. But Otter, if the chicken came first, where did it come from? And if the egg came first, where did it come from? Chickens, just like everything else, evolved from something else. And, how does evolution work? Putting it very simply, it works by genetic mutation. Let's look at the finches Darwin observed on the Galapagos Islands during the voyage of the Beagle. He noticed that each individual island had what appeared to be the same species of finch. Their song, coloring, size, nesting habits, diet were all the same. The only difference was in their beaks. On one island, they had short, stubby beaks. On another, they had long, thin beaks. Further observation showed the short beaked finches fed off seeds they got directly from plants and seeds. The long beaked finches ate their seeds off the ground, using their long, thin beaks to pick the seeds out of the cracks in the rocks. That's a result of adaption to the environment. But the longer beaks developed at first as a result of a genetic mutation that caused a bird to have a longer beak. Other birds saw that the long beak was an advantage, so finches with longer beaks were the sought after mates. beak size, not song or dance or color became the deciding factor in mating. So, according to evolution, the chicken came first. But wait! I have a wrench! Allow me to throw it into the works! That first chicken......it came out of an egg, right? So then, the egg had to come first. Because without the egg there's no chicken! Take that evolutionary argument! It's true. Logic tells us that the first true chicken had to come out of an egg. And therefore, the egg came first. 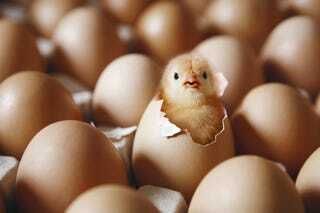 Even if the bird that laid the egg wasn't a chicken, what came out of the egg was. Scientists have discovered an enzyme in the egg shell of chickens that doesn't exist in any other egg shell. That enzyme is produced exclusively by chickens. Which means, you can't have a chicken egg without a chicken. Which means, the first true chicken didn't come out of a chicken egg. So, according to science, chickens came first. And now you can bore people with science when they try to pull the old chicken/egg argument on you.